I’m currently in the Cayman Islands, which is one of my favorite places since – like Bermuda, Monaco, Vanuatu, Antigua and Barbuda, and a few other lucky places in the world – it has no income tax. 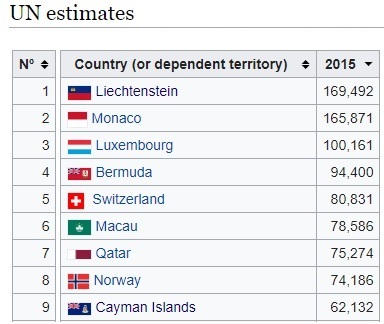 At the risk of stating the obvious, the absence of an income tax has helped make the Cayman Islands very prosperous, 14th-richest in the world according to the latest data from the World Bank on per-capita economic output (top 10 in the world if you exclude oil-rich jurisdictions). This does not mean, incidentally, that economic policy is perfect in the Cayman Islands. There is a overly large and excessively compensated government bureaucracy. Indeed, financing the civil service is becoming such a burden that the Cayman Islands almost made a suicidal decision to impose an income tax earlier this decade. And the absence of an income tax doesn’t mean an absence of taxes. Here’s a chart from a 2010 report on the jurisdiction’s fiscal challenges. Yes, the tax burden is low compared to many nations, but the government nonetheless collects plenty of revenue from import duties, fees on financial services, and tourism. But the key thing to understand is that not all taxes are created equal. Some levies impose much more damage than others. Richard Rahn, a fellow member of the Cayman Financial Review editorial board, explained this insight a few years ago in a column for the Washington Times. 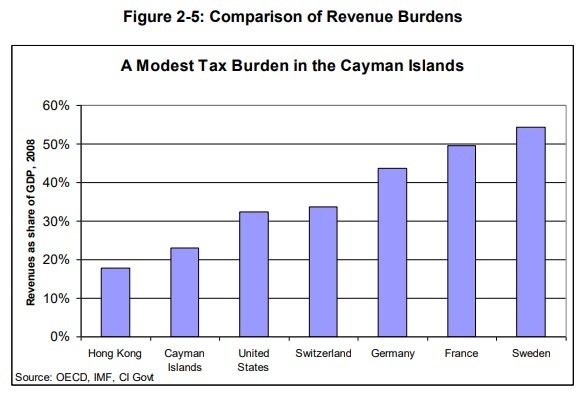 Cayman is prosperous… Critics of Cayman and other offshore financial centers call them “tax havens,” ignoring the fact that they all have many taxes, particularly on consumption — which is good tax policy — rather than on productive labor and capital — which is bad tax policy. The statist political actors in the high-tax jurisdictions will not admit that people do not work, save and invest if they are going to be overly taxed and otherwise abused by their own governments. And it’s also worth noting that the Cayman Islands are a role model for racial tranquility. There are people from 135 nations and “mixed” is the largest racial category. Here are some excerpts from a column published by Forbes about the progressive social structure of the Cayman Islands. Somebody recently said to me “The Cayman Islands is just a mailbox.” I started wondering if that was fair. The Cayman Islands are a real places where people live. And they are not all attorneys and accountants, although they do have more than their fair share. …a big upside to the Caymans. …Mr. Leung, who is of Asian descent, noticed a whiff of it in Scotland, but finds the Caymans utterly devoid of racism. Pirates, refugees, shipwrecked sailors and enslaved people might not seem to be the best material to start a country to some, but clearly there is an upside. I’ll close by noting that there is some trouble in paradise. The Cayman Islands faces unrelenting pressure from international bureaucracies and high-tax nations. There is a lot of resentment because the jurisdiction is so successful. The Cayman Islands will not be bullied by countries that cannot compete with this jurisdiction on a level playing field, Premier Alden McLaughlin told an audience… He said that despite the Cayman government’s cooperation on international standards, the Netherlands and others are more concerned about the zero tax rate here. …“But we will not be bullied by those who are jealous of our success, resentful of our tax policies and unable to compete with us on a level playing field,” McLaughlin said. What makes these attacks so ironic and unfair is that the Cayman Islands actually has much tougher standards than “onshore” nations such as the United States and United Kingdom. Since I began this column by looking at World Bank data on the most prosperous, let’s wrap up by perusing the U.N.’s numbers. 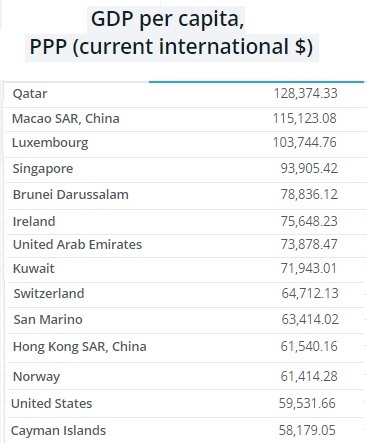 Hmmm…, lots of so-called tax havens are on this list. I wonder if we can draw any conclusions? Folks on the left have accused me of “trading with the enemy” for supporting these jurisdictions, but the real story is that we should emulate rather than prosecute these low-tax jurisdictions. P.S. My affection for the Cayman Islands is mutual.